SEO is continually changing. As a business, it’s important for you to stay ahead of your competition but this means you must first be aware of what they’re doing. With the start of a new year there are some SEO trends you simply don’t want to overlook. We’re seeing more people use their mobile smartphones to visit websites and conduct research while on the go. Google is cashing in here with its mobile-first indexing whereby they rank websites based on a mobile user’s experience. 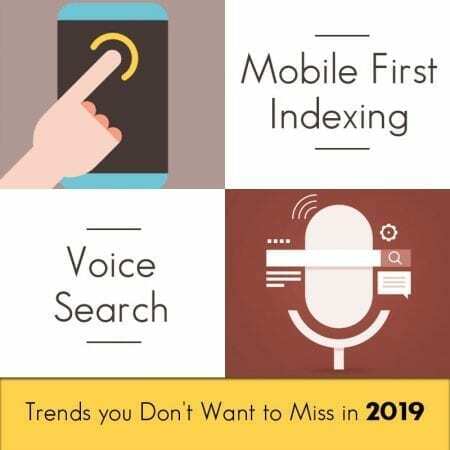 This has led to the SEO trend wherein we see mobile versions of a website being indexed instead of the desktop version. As such, websites that aren’t mobile-friendly are missing out on a lot of traffic, which is why it’s so important to make your website mobile-friendly today. A growing number of people are using smart devices and smart assistants (e.g. Alexa, Siri) and this is something that will become even more important this year. We already see that 20% of Android queries are conducted via voice search. This is one of the many SEO trends businesses must be aware of if they want to be successful. As you set yourself up for this one thing you must remember is that voice searches are longer than typed searches. They also contain longer-tail, more conversational keywords. This is good news for you though because they’re less expensive and get a better click-through rate. Google’s goal is to quickly provide users with the best experience possible, which is why they’ve been considering mobile page speed in their rankings since July 2018. This doesn’t mean that intent is unimportant. Slower pages with relevant content still rank better than fast pages with irrelevant content. Nevertheless, one of the SEO trends we’ll see more of this year is the use of accelerated mobile pages (AMPs) because they load 30 times faster than a regular page. Google will list URLs with he highest content relevance first, but users will only see what truly meets their intent since Google can evaluate this in real time. Long-form content will be one of the SEO trends we see more of because this is what Google is looking for here. Of course, both quality and depth are still important here too. So, make sure your content is both engaging and in-depth. These are just a few of the SEO trends we’re bound to see. While nobody is certain how blockchain will effect SEO, we’re likely to see more experimentation throughout this year. Businesses are also looking for ways to use AI. This could bring about some interesting changes since it’s at the heart of everything Google does – including Gmail, creating robots that sound like humans, and gathering news headlines. As mobile search continues to increase it’s important to protect our user’s data. This is something that’s more important than ever before. One of the best ways of doing this is by creating relevant content that meets their needs while also taking things like AI and blockchain into consideration. For help with all these things contact the Affordable SEO Company today.